Colin Kaepernick Gives Props To Two Miami Dolphins Players Who Kneeled During Anthem + Cop Your Kaepernick Jersey Now! Colin Kaepernick has been blackballed from the NFL (he's suing the league for collusion), however, the peaceful protests are still happening. 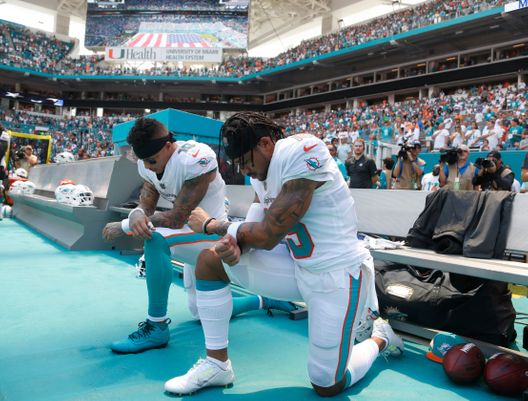 Two years after Colin first started kneeling, two Miami Dolphins players are keeping the protest alive. 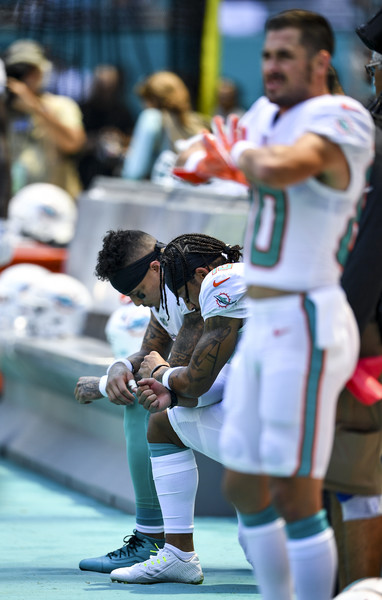 Dolphins wide receivers Kenny Stills and Albert Wilson took a knee during the National Anthem during week 1 of the 2018 regular season in an effort to raise awareness about racial injustices. The Dolphins were playing against the Tennessee Titans for the season opener. They are the first players to protest during the regular season amid all of the controversy. These two players also took a knee during preseason. A movement’s power doesn’t come just from those in positions of visibility...it comes from those who lend their voice to conversations and bring things previously thought to be status quo into question. I’m grateful for those who have kept focus on the task at hand: advancing the conversations surrounding social justice in this country. Despite the measures taken at various levels to distort our message, we will continue doing what we believe is right to promote a dialogue about racism, injustice, and inequality in this country. Thank you to those who are committed to advancing this dialogue whether you agree with our demonstration or not. Stills said he will continue to kneel throughout the season until a team picks up Kaepernick or NFLer Eric Reid. He too has been blackballed and filed a collusion grievance against the league. Dolphins defensive end Robert Quinn also raised a fist during the song, as did San Francisco 49ers wide receiver Marquise Goodwin before his team's game against the Minnesota Vikings. Denver Broncos wide receiver Demaryius Thomas and linebacker Brandon Marshall both stayed in the locker room. Back in May, the NFL announced they would require all players on the field to stand during the anthem. In July, that rule got put on the backburner as controversy came to light from the Dolphins camp. They were receiving hella backlash after a copy of the team's discipline rules were leaked and it said that anyone who took a knee during the anthem would be suspended, fined or both. It was then announced the NFL's policy would be postponed as the groups (NFL, NFL Players Union) attempted to work out a compromise. My Brothers @kstills and @ithinkisee12 continue to show their unwavering strength by fighting for the oppressed! They have not backed down, even when attacked and intimidated. Their courage will move the world forward! “Love is at the root of our resistance! "Official #IMWITHKAP Jerseys available for PRE-SALE now! Limited Edition. 20% of all proceeds go to @yourrightscamp. Thank you for your continued support! Shop at kaepernick7.com. Link in bio," he captioned. As you all know, Nike tapped Colin for their newest campaign and some folks were mad. Ha! Some haters even burned their Nikes in protest. However, a report came out today revealing Nike's sales are UP. According to NBC News, the brand's sales went up 31 percent since the quarterback-turned-activist's campaign. Bloop! So much for folks saying big bands shouldn't stand behind social issues. I stand for giving everyone a voice. Adidas giving me a voice and Nike giving Colin voice on a big business level makes the world a more advanced place.